Along an industrial strip of Jefferson Blvd just west of La Brea Blvd parks Beto’s tacos. 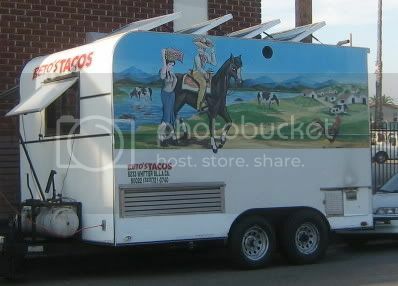 Pumping out tacos, burritos and tortas well into the night or until the propane runs out Beto’s is as much a neighborhood taco wagon as it is an afternoon taco stop for the working man. Inside the truck three hombres were hard at work slicing and dicing meats while a TV mounted in the corner was turned to Telemundo. All the signs of a great taco wagon were present: Compartments with salsas(verde, roja, avocado), cilantro, onions, radishes, jalapenos. Of course this wouldn’t mean a whole lot of the meats weren’t well prepared. But never fear, these fellas know how to please. The asada was moist and flavorful but it’s the al pastor cut right from the roasting spit that shined. Seeing a vertical spit with a rotating slab of seasoned pork is like blood in the water for the al pastor devotee and I became shark mouthed waiting for the impending plate of pork and carmelized onions. There’s a good vibe at Beto’s . It’s the kind of truck you can’t wait to get to at the end of the work day to pop open a cold beverage and relax with a plate of tacos. I love your site. I am a devotee of the Highland Park taco scene (El Pique, La Estrella, Tacos Michoacan, etc.) Recently I came across another fine addition to these - a taco truck called Takitaco that parks at night next to the Food4Less on Figueroa and about Ave. 50. So far I have had the asada, al pastor, and pollo and all are excellent. There's another stand I haven't tried called El Metate on Figueroa a few blocks north that I hear great buzz about as well. Ijust keep coming too late - they close just before 9PM. Good luck on the hunt. i just recently fell in love with what my best friend and i call pocket tacos. 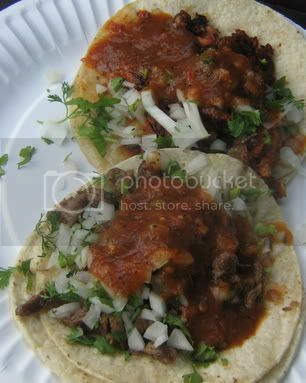 on these hot summer days nothing makes my day like a plate of al pastor tacos stacked with crisp onions and cilantro with a generous squeeze of lime. add a super huge horchata to cool the flames of hot slasa, and i'm set for pure joy. i was so excited to stumble across your blog! 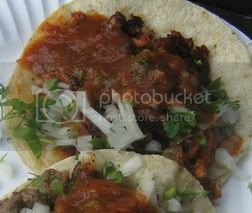 I'm a foodie from l.a. myself, and i was looking for tacos up here in oakland, where i just moved, and found your blog. sir, you are my hero. if you wanna eat some tacos with two lovely taco afficionadesses, you should drop me a line. oh, check out my food blog. i'd be honored. it's on blogger and it's called "the comfort food zone." How about a map link at the end of the posts? Do you know the hours of operation of Beto's Tacos"
I plan to give Beto's a try soon. highland park is the unofficial taco capitol of Los Angeles. So many great taco trucks. thanks :) http://tacotrucks.net/ is a site that has reviews of Oakland taco trucks. Not sure how they compare to the LA taco though. Not sure of the hours of operation but they usually get there at 6pm. I've seen them there earlier though. We were there at 6:50 tonight and it was clear they had been there for a while. The carnitas melt in my mouth and the roja was just spicy enough. The woman taking our order was super nice as were the folks waiting in line. Parking was a bit difficult, but the tacos were worth it. Great site!